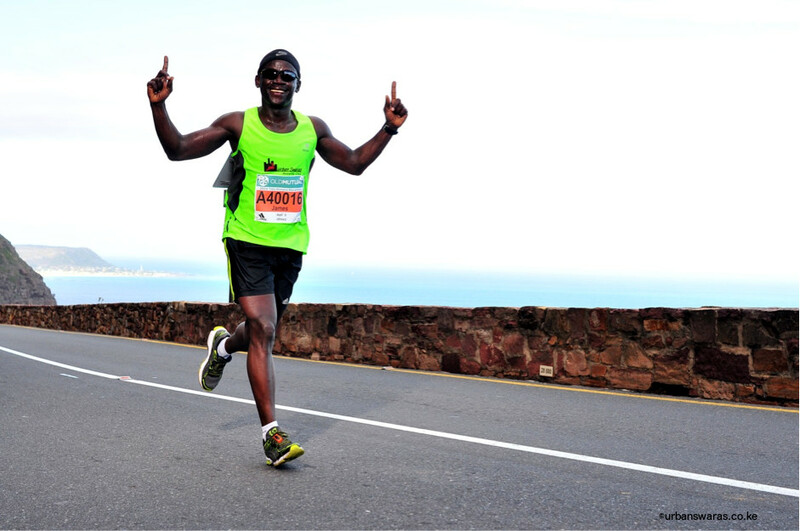 Now that the dust is settled, the oceans are calm and wine is out of the system I can finally recount the rollercoaster events that made The Two Oceans Ultra Marathon a lasting memory. There is nothing that I can say that that have not been said about this run. 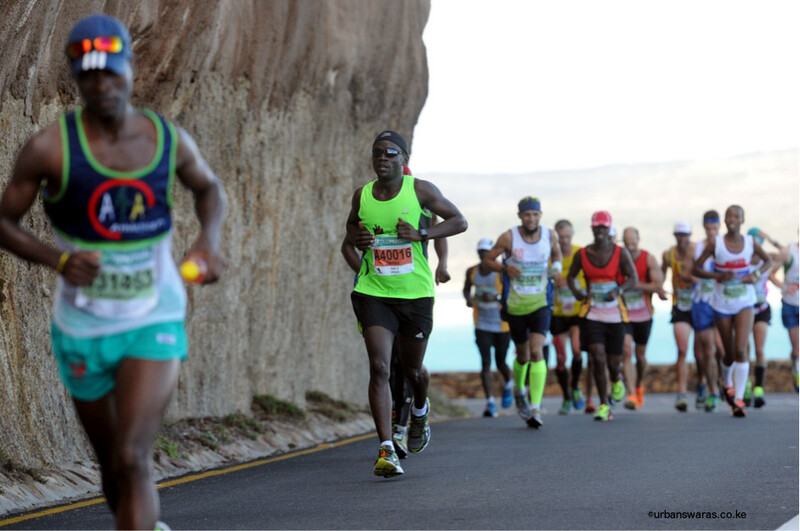 But at the risk of repeating it one too many times, the run indeed fits the tag the world most beautiful marathon. I will keep it simple. I ran the ultra and came home in 4.53 and really enjoyed the scenic route and will definitely go back. I would recommend the run to all Swaras and may it be up there in your bucket list. It’s worth every ounce of pain and every dime spent on it. That’s the official statement. I have read the accounts of all the other Swara participants and since they decided to be mainstream. I will take the opposite direction and go all tabloid. Keep reading for a recount of all the events on the sidelines of the main event; the red carpet, the after party and anything ratchet that caught my attention. I landed in West Cape two days before race day, Visa issuing authority in tow, sometimes they insist on seeing firsthand what is done when we are on “tour” and to make sure that the “visa terms” are not violated. The training journey was done with words of one James Waliaula echoing in mind that, the joy is always not on the race day but rather during the training in build up to the main thing. For this reason, my two long runs, a 45km and 50km were done in hills and scenic tea plantations of Tigoni; throw in a full marathon in Kilimanjaro (at 3.38) and a 40km in the simmering heat of Osotua and I could be forgiven for feeling cocky in the run up to the 56km. Ajaa kept insinuating that I’m over-cooked for the challenge. If you thought running on a marked trail was a challenge, try running on your own, especially when your watch decides to behave like the Chairman (never trust him on distances; a 10km can easily translate to 17.673km). You have to carry your own water and bananas if need be. It’s a big task but I guess at the end of the day it’s a sacrifice worth it. We visited the expo, which runs for 3 days in run-up to the race, and on show were all manner of running gear; it’s a one-stop shop for anything running. I pick my running kit on day one. Day two, it’s the International Friendship run (a run for all the international runners). 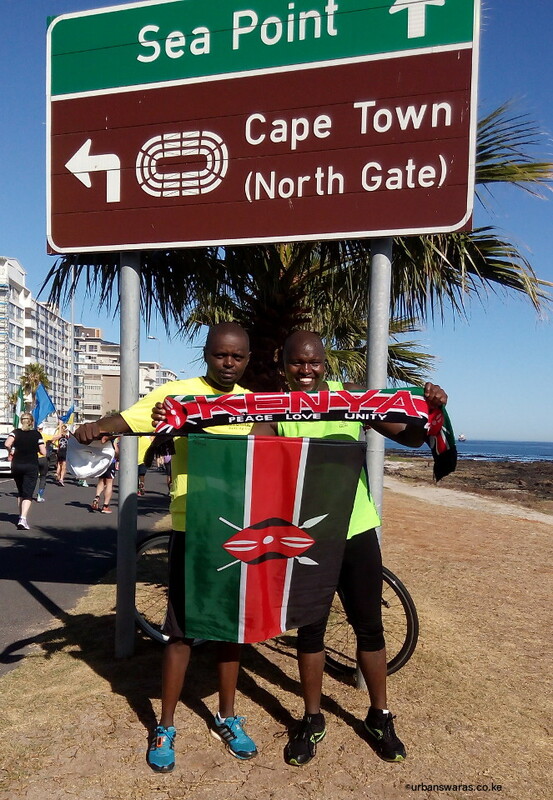 A 5.6km run officially but turns out to be just shy of 7km and guess who are picking the Kenyan flag; Swaras of course. The acclimatization run is done and we are all ready for the big day. Saturday 26 March is here with us and breakfast is at 3 am since we have to leave the hotel by 4.30am. By the time we get to the starting point, the heavens have opened up and torrential rains are coming down heavily. Yours truly is on a singlet and it’s a very cold day in hell. The pre-race antics are breath taking. The “shosholoza” and South African National anthem are belted out in a nerve-wrecking manner. The Ultra has a field of 11k runners and only 2k are internationals and that just tells you how people love running down under. 6.30am and the gun is off and off we go. 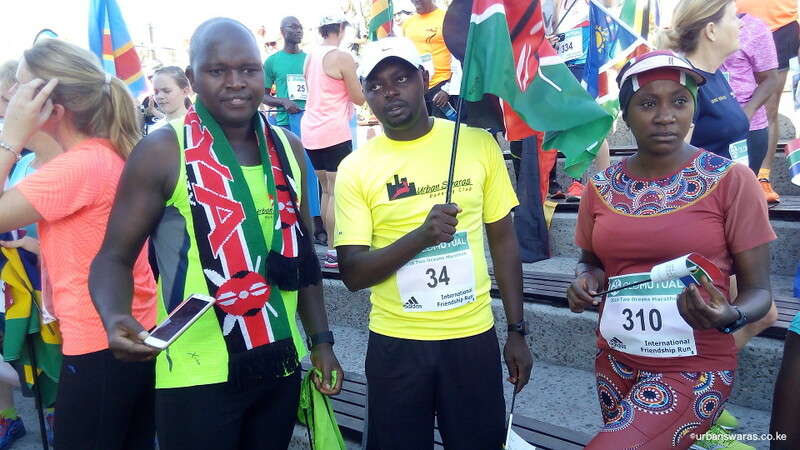 I must say the meticulous organization of this run makes the like of Nairobi Stanchart resemble poorly organized village run-arounds. The cheering on this run is something I haven’t experienced before. From the school kids on the road, the Johnny Cash doing a one man show, singing country music from the balcony of his house, the all green trumphet band at the peak of Chapman’s Peak, the all orange squad (resembling the Holland football fans). It’s fanfare for all and sundry. 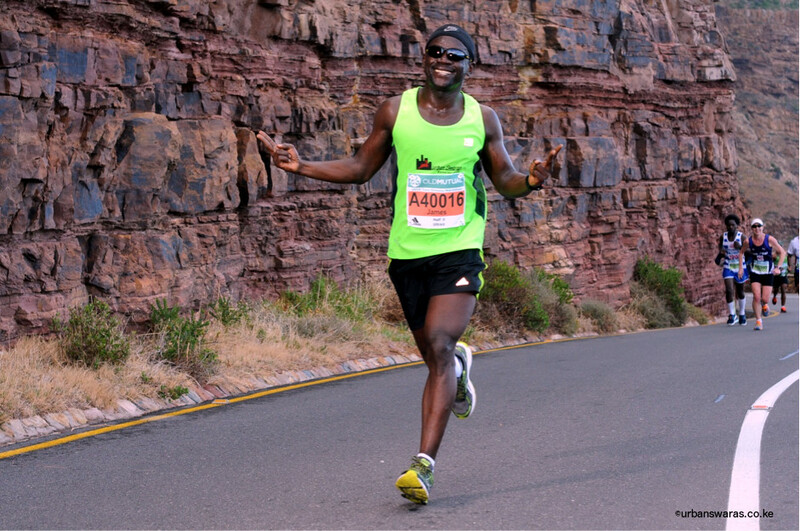 I ran the first 20 something kms at a very comfortable pace of 4’40”s and things get thick as you start to ascend the Chapman’s peak in the mid 20s which take you to the 30th km. The sub 5 hours group catches up with me at almost the peak of the hill and these guys sing as they run and you can’t help but join in. After the hill, it’s rolling down until 42kms. There are billboards all along the route; living my dream, running for more than yourself, one ocean down one to go, just to mention a few. I get to the 42km mark just below 3.30 and that’s where this ultra starts, exactly after the marathon ends. 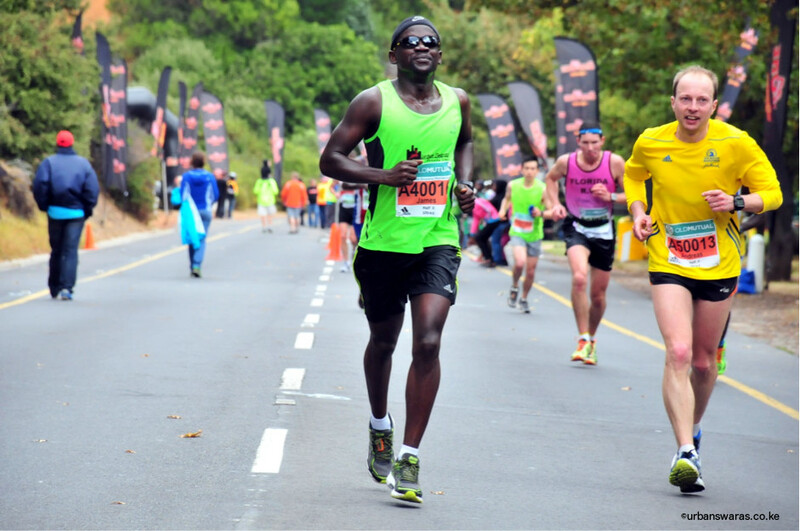 The Constantia Nek Hill starts almost immediately, an unending 4km or so of hill. The public address guy is all over our ears, unrelenting in a song that goes “like 4 up and 10 downhill, you can roll down all the way to University of Cape Town (UCT)”. Bad lie. There was nothing like 10 downhill. On that hill my pace of under 5mins per km for all 42kms fell to almost 8 min per km and a guy cheering on the sidelines catches me on my walk and shouts, “no walkers big man, keep running” at the peak of the hill is a guy calling the name of each runner and encouraging them. The PA system is blasting Justin Bieber’s “Sorry”, and clearly at this point it’s all you can feel for yourself. I start to roll down but it’s not all down hill as advertised. At around 50km, there is a granny on the sidelines with a big placard “run faster, I just farted”. With one km to go, yet another billboard “see you next year”. I glance at my watch its 12 mins to top 5 hours. I smile knowing that I will beat the sub 5-hour barrier. I come home at around 4.53 and the cheering at the finishing line, one can’t help but get a bit emotional. I stick at the finishing until they close at 7 hours and Swaras come streaming in one by one. Evening after a run is always a time to enjoy and reward the body. I hook-up with one John Kuria and set forth to Join Jack Ndegwa at the waterfront. The heavens have decided to bless our work well done. This has to be one of the longest waits I have ever endured to get a beer. First at the Malls at the waterfront, we are told to wait for at least 40 mins before we are allocated seats. Not us. We can’t get out to the street bars since it’s raining heavily. We decide to hit town, first stop is Cubana; bad idea yet again. Jack cannot be allowed in. Reason? Not in the right attire, a track suit. We try to convince the “bouncers” we are these super humans who ran 56km earlier in the day but all he can ask is, what the hell is two oceans, who cares. They can never have any of it. Jack has to go and change. He never came back; I never would have either. Another hustle is to get allocated a table. You have to go and sweet talk some yello yellos at the entrance who ask for your number, they will send you the table number; too much trouble. Silver lining is that you can order at the counter and we all agree let’s have a one each at the counter and head out. As we leave, another Swara is joining us , one Lilian Onduko. She was over the moon; she made it under the 7 hrs (congrats Lilian). We relocate to Long Street and finally we can drink in peace. We leave just as it’s starting to happen on Long Street at around 1. Evening well spent after a very successful day on the road. Sunday is spent on the City Tour bus, visiting the wineries (such a boring affair to me, may be am still too young to appreciate wines), up the Table Mountain, and drive up and down Constantia Nek hill. Monday is another day spent on the Robben Island, and again I can’t wait to be done with the tour as it sounds like a literature class nothing much to talk about here. Tuesday is a journey back home but before that, the most active day for the Visa Authority, it’s a day to go shopping and the pain (on the wallet) is more than running up Constantia Nek Peak. I had to feign tiredness and insist on us leaving otherwise the damage may have been too much to bear. Finally it’s time to say goodbye to the Mother City and head home. Thanks to many who played a part in one way or another to enable us go to Cape Town and run and carry the Club’s flag up and high. 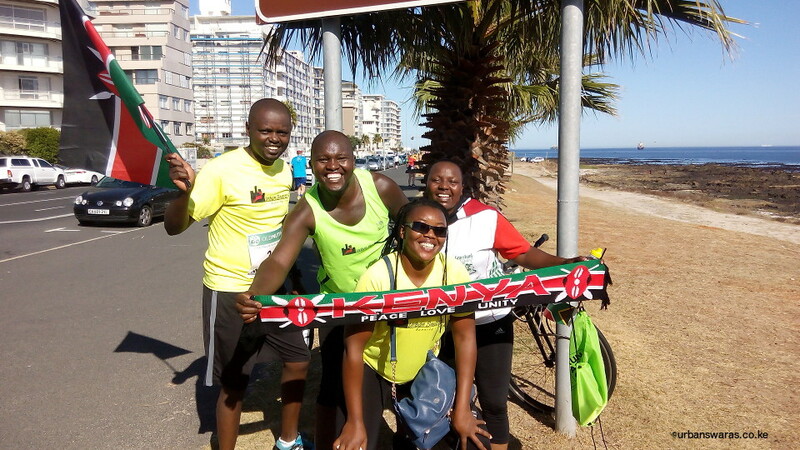 Notably to Tata Nduku for setting up a WhatsApp group for the runners even though she was not participating. Be blessed. Mr. Chairman for always keeping in touch and always eager to find out how we are doing and faring. Hats off. Thanks to the CRE for the many challenging runs set up to prepare us for such challenges. Did I hear King James call for Comrades power? Well, thanks but no thanks James. All the best mate. May be in a year’s time. 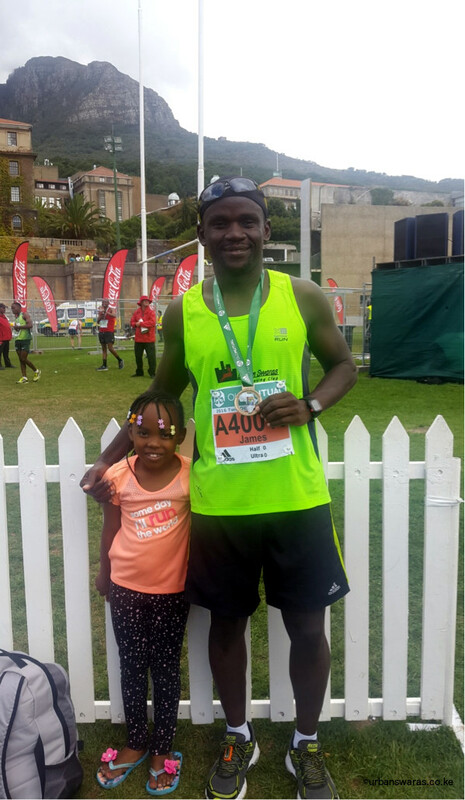 As they say, beauty is in the eyes of the beer holder and I saw it in Mother City and I will definitely go back to run this one.